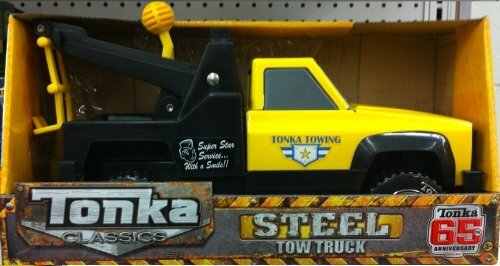 The Tonka Classic Steel Tow Truck is built to last! 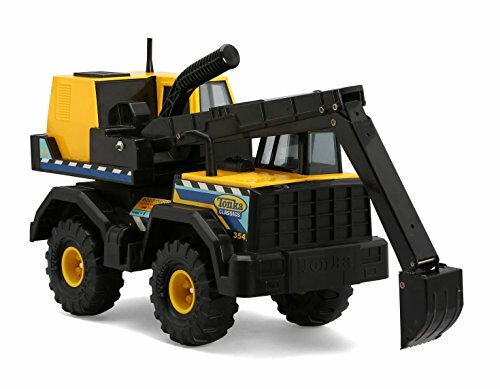 This sturdy truck's realistic design features a four-position lift that really lifts and tows, and deep-cleated tires help young "drivers" maneuver like a pro! Best of all this tow truck is made of steel and guaranteed for life! Appropriate for ages 3 years and up. 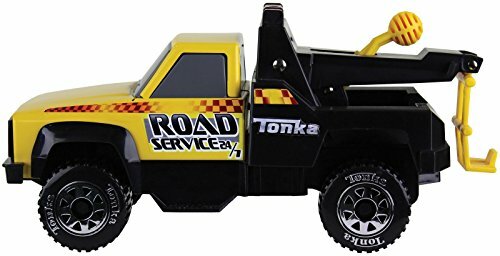 Tonka Steel Retro Tow Truck This sturdy truck's design features a four-position lift that really lifts and tows, and deep-cleated tires that help young "drivers" maneuver life a pro!Features:Features: Steel construction, free-wheeling, working lift for towing action and is guarenteed for life! Wheel chocks and fold-out support legs ensure stability. Truck cab has windshield, foldable mirrors and tilts forward, revealing engine block. Cross country vehicle has hood that opens, functional steering and fold-down windscreen. ABS plastic. 19 1/2in.L x 7 5/16in.W x 10in.H. 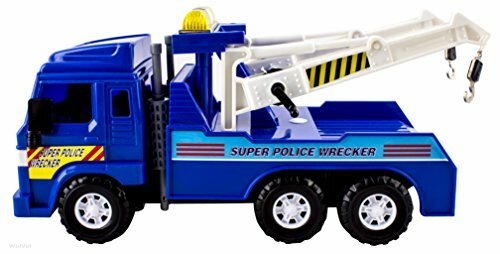 ;From the Manufacturer; Everyone has seen this breakdown truck in action as it loads a vehicle involved in an accident and takes it to be repaired. 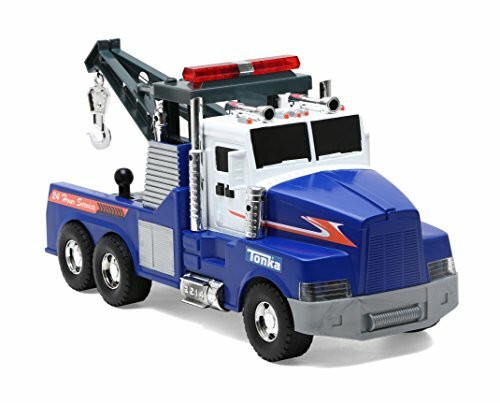 To recover vehicles, the loading platform can be removed and the crane can be extended and swiveled. The extendible wheel lift and the load handling gear, consisting of tracks and wheel clamps, enable safe and fast towing. Wheel chocks and fold-out support legs ensure stability and profiled tires complete the picture. The tipping driver's cab of the MAN provides a view of the engine and the mirrors of the driver's cab can be folded up. The engine bonnet of the cross-country vehicle can also be opened and its windscreen folds down. The cross-country vehicle can also be steered. 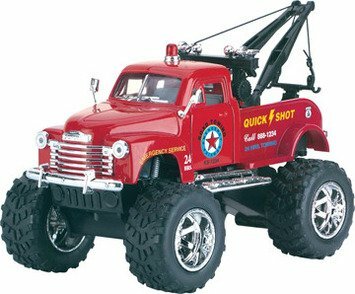 The Schylling Big Wheel Tow Truck is just what you need to get any vehicle out of an problem! 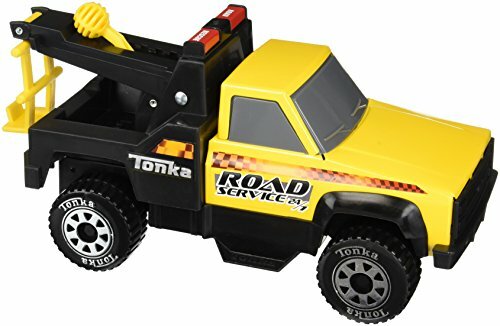 This die cast tow truck has giant wheels that allow it to move through any conditions. 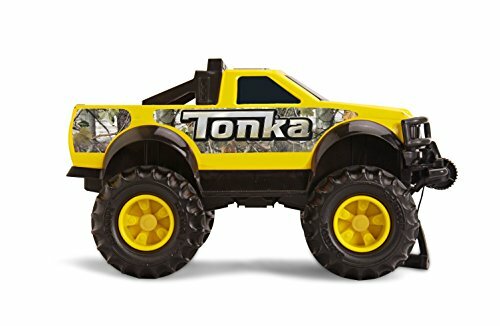 The Tonka Classic Steel 4x4 Pickup truck is ready for any off-road adventure! Built to take on the most treacherous trails, this sturdy pick-up truck also features a working winch for towing action and is guaranteed for life! Appropriate for ages 3 years and up. 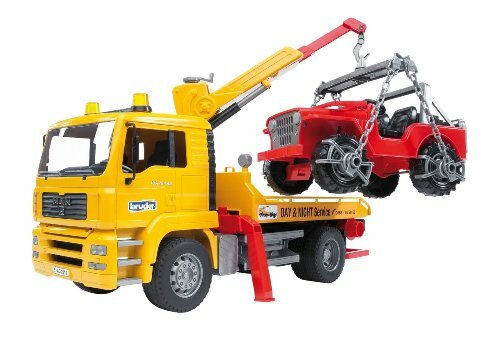 Classics tow truck- just like the real thing! Tonka vehicles are built to operate in the toughst outdoor conditions. Really lifts and tows. The Tonka Classic Steel Backhoe is built to last! This sturdy, steel construction vehicle is ready for the toughest jobs. With a rotating cab and moveable steel arm and bucket, you can really move some dirt! Built Tonka tough and guaranteed for life! Appropriate for ages 3 years and up.